Giving an official word to one of the imminent post-papacy's most-sought questions, at today's transition briefing, the Vatican spokesman Fr Federico Lombardi finally confirmed that, upon his resignation Thursday evening, Papa Ratzi will be known as "His Holiness Benedict XVI, Pope-Emeritus," and retain the signature clothing of the pontiff's office. According to the early wires, Lombardi said that in retirement, Benedict's future vesture will lack the shoulder-cape of the standard white house cassock. Even that, however, is nothing the departing pontiff will mind a bit – in the early days of his pontificate, B16 sought to introduce the use of a cape-less fillettata, but the Vatican handlers he inherited were unable to countenance its everyday use. Over the years since, the Pope has used the simple white cassock whenever he's been allowed to do so, most often on his summer holidays, as seen above. 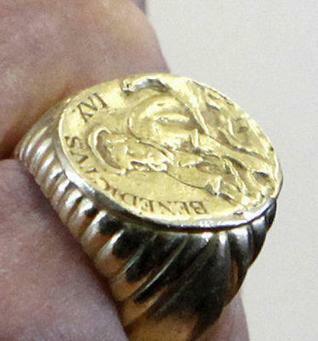 At the same time today, it was also confirmed today that – keeping with the rites scripted over centuries to mark a papal vacancy – the Fisherman's Ring with which Benedict was invested on his 2005 election (its casting a departure from the past) will indeed be destroyed to symbolize the end of this pontiff's authority and, per tradition, protect against any potential forgeries of documents. As noted when the now-announced title first emerged, no modern precedent existed for the status, titles and prerogatives of an ex-Pope. 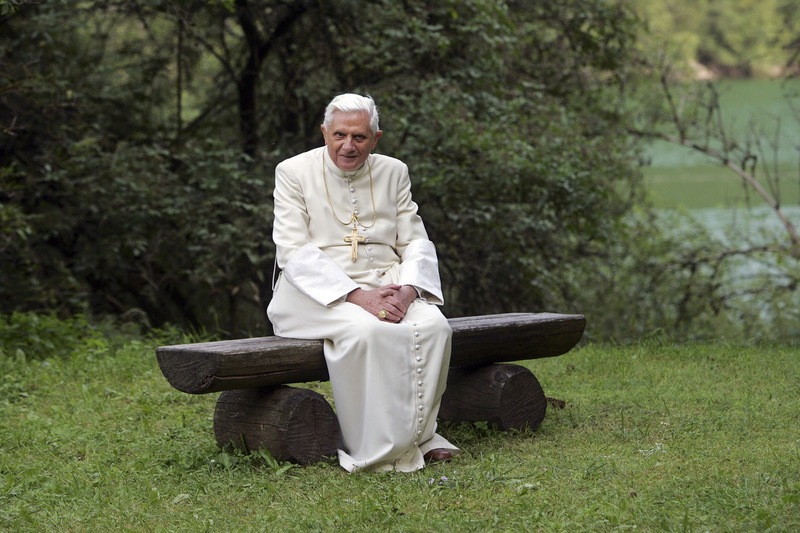 Accordingly, Benedict's wishes now set the standard for the reality into which, so it's been said, he's long felt the "duty" to usher the office that oversees the 1.2 billion-member church.